I’m part of generation X. We were a big deal back in the day. I still find myself using terms like “da bomb” and the aforementioned “back in the day.” I’ve tight-rolled my pants a time or two. I grew up with 3 TV channels and cartoons on Saturday morning & for one hour every afternoon ONLY. Punishment for wrongdoing often involved not being able to play outside—or spankings (yes, plural). Sometimes I even got to choose between the two. I climbed trees, built forts, and played war with toy guns. I was taught that men and women both had behavioral standards. The only car that could talk was Kit. I was often stuck to the wall while talking on a phone and Internet wasn’t even a word. To see my friends, I had to physically place myself in front of them. We’re the last of our kind. Dinosaurs, I suppose. I have a brother who turned 34 this week. For the next 30 days, we’ll be the same age. 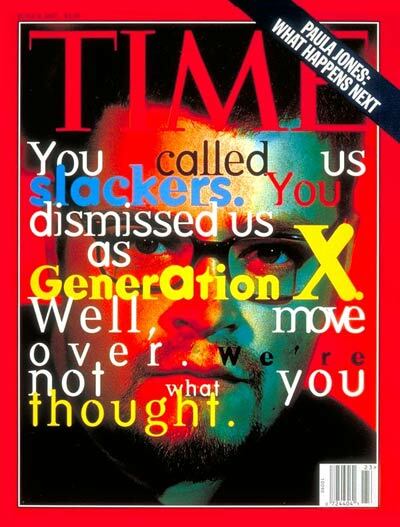 We just barely make the Gen X cutoff. But we also have twin brothers, about 8 years younger than us. And they are full-blown Millennials. I’m sure you’ve heard of them. They are the generation getting all the attention lately. I realized today that my generation could be the true bridge between the Builders, Boomers, and Millennials. (Again, not the largest revelation ever.) I was raised without all the technological hoopla, but I’m fully aware of how to use it, and I’m often more immersed in it than I’d like to be. Although I tend to read other versions, when I quote scripture, I typically find myself reciting the KJV. It’s what I grew up with. Black and white truth still existed in my upbringing. But I’m fully influenced by postmodernism. So to be honest, I feel like I see both sides of this generational divide. And I feel as if I can speak to both generations. Perhaps this is presumptuous on my part, but I hope not. Somebody needs to bridge this great divide. And I believe us Xers are in a prime position to do just that. We need to speak of the value the generations before us had. We must let them know that they did (and do) well. I’m so very appreciative of the work ethic instilled in me. I’m appreciative of the black lines they often drew. They let me know that truth does exist, and it can be followed. We need to connect the young-ins to such ideas. Sure, truth gets distorted. It gets watered down and misunderstood. We backtrack and admit wrongful interpretation from time to time. But that doesn’t mean truth is non-existent. It can be tough to interpret in an ever-changing culture, but it’s there. The Millennials will lead us into the future, and I’m sure they will do it well. But there’s much to be learned from the boomers and builders. And I think us Xers are the key to the conversation. So I’m saying, “Walk on me.” I’ll attempt to be the best bridge I can be, because nobody’s ever lost anything in connecting the generations.